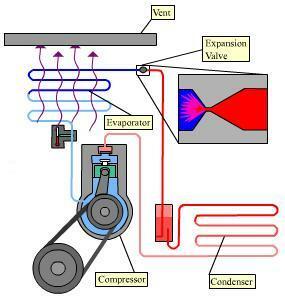 HOW DOES AIR CONDITIONING SYSTEMS WORK? There are various kinds of auto AC systems, basically they all work in the same manner. Warm air passes over a refrigerant, transfers its heat to the refrigerant and becomes cool air entering your vehicle. Air passes through the vent into the interior of the vehicle. The Expansion Valve determines the correct amount of refrigerant going into the evaporator, and it lowers the pressure of the refrigerant. When the compression starts, the expansion valve opens and the liquid refrigerant flows into it. Once in the expansion valve, the refrigerant is correctly pressurized. As the evaporator calls for more refrigerant, the expansion valve allows the required amount of refrigerant into the coils. The evaporator is a long tube that goes back and forth through a set of cooling fins. The refrigerant enters the evaporator and a fan blows warm air over the evaporator. 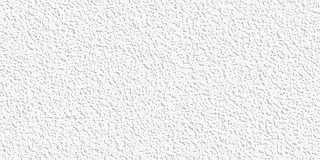 The cold refrigerant absorbs the heat from the warm air. Once it has absorbed the heat from the warm air, the warm air isn't warm anymore. The same blower that blows the warm air (that is now "cool" air) over the evaporator, keeps on blowing it into the interior of your car, and you have -- air conditioning! The compressor in your car works in a similar way to the one in your refrigerator. The job of the compressor is to move liquid refrigerant around in a pipe. The compressor pumps the liquid from the evaporator into the condenser and expansion valve, and then back to the evaporator. The condenser is a long tube that goes back and forth through a set of cooling fins. The condenser is mounted in front of the radiator to catch the forced air provided by the fan and the motion of the car. As the refrigerant flows into the condenser, it gives off heat. The refrigerant is warmer than the air passing over it so the condenser hands its heat off to the air and turns the refrigerant back into cool liquid in the expansion valve, where it heads back to the evaporator.